For our second interview, to show off our crew, we present to you … Joel Young. Ok, first one’s easy, Coffee or Tea? Anything decaf. Don’t judge me. How did you get into the tech realm? Well, my first step was to get a Double Honours BA in Philosophy & Literature (President’s Medal), then I got an MA in Critical Theory rendering myself effectively unemployable. I’ve always been into tech on my own time, so while I was waiting to apply for PhD programs I took an entry level job with a former colleague in his brand new SOC. From there I took resident security & networking guru Matt Watkinson up on his offer that “there are no dumb questions” thousands upon thousands of times and documented everything I learned until we had developed rigorous operating procedures for the SOC. What I may have lacked in 1337 h4x0r skills I strove to make up for in attention to detail and a will to learn. I remember the first time I got promoted, I felt I had to be honest with Peter and Vinay that I was probably going to leave within six months to pursue my doctorate. They asked me to give them a year then decide if I still wanted to go. That was three years ago. I began as an underqualified Tier I Analyst and now my role is to develop and drive processes, organize and manage resources and to direct the implementation and delivery of new and existing services. What is your technological super power? Harnessing the talents of hackers for the common good? What has had the most significant tech change since you’ve started in this industry? Remember when SIEM was considered optional? Today, attitudes toward security expenditure in the corporate landscape and many SMB organizations are beginning to embrace the idea that securing your IT infrastructure ought to be indissociable from building the IT infrastructure that supports your business in the first place—it’s the cost of doing responsible business. But change doesn’t happen all at once and it’s still all too common that IT budgeters allocate whatever is left over to security. A threat doesn’t need to be big, in fact almost any vulnerability will do. The idea that ‘something is better than nothing’ or trying to buy this year’s ‘only security appliance you’ll need’ should be taken for what it is: an appeal to the economics first, security later mindset. You NEED strong and actively enforced security policies. You NEED NGFWs. You NEED an endpoint solution. You NEED IPS. You NEED vulnerability management. You NEED a SIEM to aggregate all of your controls to make it possible to analyze massive amounts of security data to achieve that “holistic view” everyone’s talking about. You especially NEED trained personnel to administer, monitor and maintain all of these controls in real-time, 24×7, who won’t neglect them when things get busy. Economic imperatives are a fact of life and so are security vulnerabilities. You can spend millions on security and maybe still get breached; but if you’re not honest with yourself and your stakeholders about what it costs to maintain a responsible and mature security practice, you are complicit in whatever the “biggest technological threat” to your organization happens to be this year. 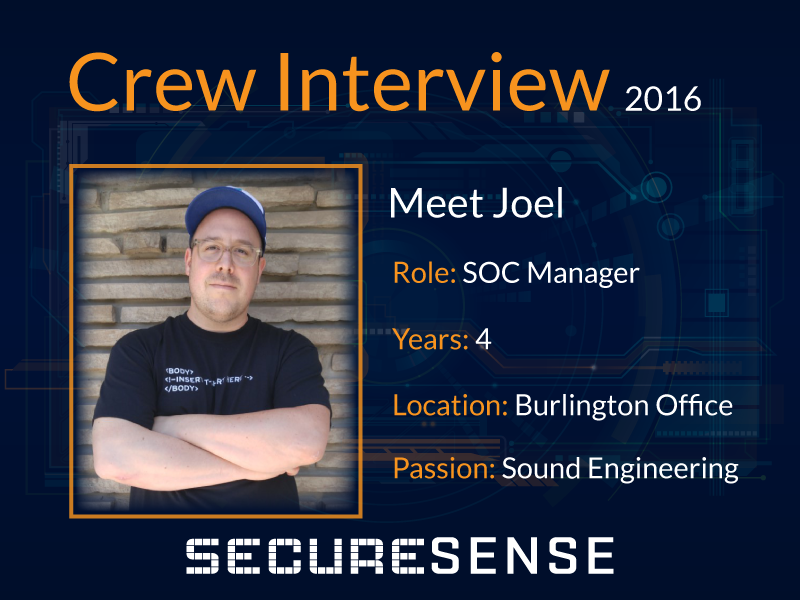 What is your favourite part about working at Secure Sense? Secure Sense is that environment you’ve always wanted to work in where everyone is talented and works their face off, but the arbitrary rigidity of corporate culture has been transgressed and the spirit of the renegade startup persists even as we’ve evolved into something larger. Ok, last one … it’s vacation time and you could be anywhere in the world right now, where would you be and why? I’ll be at the cottage. Cheers.